By learning to mark deals lost earlier in the sales process and of my own accord helped me spend more time on deals that were winnable and less on those that weren’t. Consequently, I felt that the deals I spent time on were genuinely at least 70% winnable, keeping my sales pipeline clean and my sales velocity high. Turn reactive losing into proactive losing, based on your judgment of whether they fit into the 70% winnable category. This means shifting most of the losing from the end of the sales cycle toward the beginning. Codify, standardize and review your reasons, and make your criteria rock-solid. Every week, review all open deals as well as the lost deals from the previous week. Understand your losing and winning categories (on price, on product features, in a specific industry, or other) and fine-tune your tactics on a weekly basis by learning from this knowledge. Know your ideal customer profile, and figure out how to get as many prospects who fit the profile into your pipeline. The ideal customer is one with whom you have the best possible strategic fit across the board – you have great product/need fit, buyer/seller behavior and cycle time fit, and budget/price fit. Everyone of us has what I like to call a CPU (central processing unit). It’s your brain. Having deals with less than 70% likelihood of winning in your pipeline takes up a lot of CPU computing power. Even if you aren’t spending a lot of time on these deals – deals that I like to call undead – they are still somewhere in the back of your mind, glimmering false hope of cash flow and profit. The key factor to sales success is pipeline velocity – the speed at which you’re able to move deals from your first contact with a prospect to a successful close. Having lots of undead deals sitting in your pipeline means your pipeline velocity considerably slows. They take up screen space in your pipeline, and they make you think about them every day while never moving closer to a close. Often what you get when you speak to this kind of prospects are empty promises, such as they’re going to review the purchase opportunity next month and get back to you, or that they are waiting on a budget decision that should arrive soon. The reasons vary, but one aspect stays the same – these deals take up a lot of your attention and time, and they’re unlikely to end up as won. You should be open and clear with your prospect by proactively asking straightforward questions. One of your questions should be, “Based on the need you told me about, and the solution we discussed here, do you see yourself buying anytime soon, like in May or June?” You can use it in different sales stages in a slightly modified way. If the answer is “we’re not sure,” or “I can tell you in a couple of weeks” or anything similar, you should politely end the sales conversation. It’s valuable to learn what’s behind the “we’re not sure” responses, but if evidence of not moving forward exists, you should stop exploring this particular opportunity. Lose the deal, get it out of your pipeline and start focusing on the deals you can win. How you should manage your reasons for winning and losing as a sales manager is about codification and standardization. You need to agree first on how to mark your deals lost – what you include in the description is important, as it will help you analyze the categories you are losing in, the behaviors that are inhibiting your salespeople from winning and so forth, giving you the insight into fine-tuning your sales machine for better results in the future. At your weekly sales meeting, always talk through the open deals your team has, as you’ll understand the potential pitfalls and brakes and address them. It’s just as important to talk through the lost deals from the previous week, as you’ll be able to see what went wrong. A key aspect here is the standardization of lost reasons. Over time, you should have an overview of the categories you lose in the most and the reasons why. Standardize these reasons, so that you could start getting statistical insight into your team’s behavior. You as a sales manager should encourage as much detail as possible to be included in the comments section of each lost reason, as this will provide valuable context. By collecting the lost reasons and reviewing them on a weekly basis with your team, you’ll be able to understand the different ways your salespeople stuck. As you collectively go through the lost reasons, other salespeople can suggest how they deal in similarly problematic situations, how they overcame a specific objection or how they drove a similar deal faster. You may discover that different salespeople get different reasons for losing from potential customers. And that’s worth studying. Tactically, this will give an immense return. It gives rise to continuing training, using the strengths of your team to address the weaknesses of your team, driving the consistency of your team’s overall quality. Just as importantly, it could give you insight into improving your product or the whole sales process. 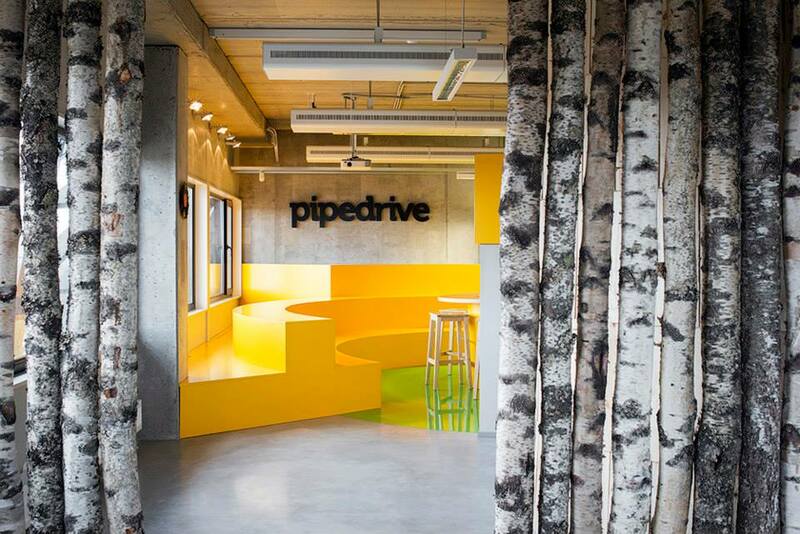 I’ll give you an example how you could perform a category analysis using data from Pipedrive. For understanding the aforementioned trends, losing categories and losing reasons, you’d use the “Deal Lost” feature. First, make sure that everyone in your team uses the lost reason and additional comments boxes, so you could go back to the data. 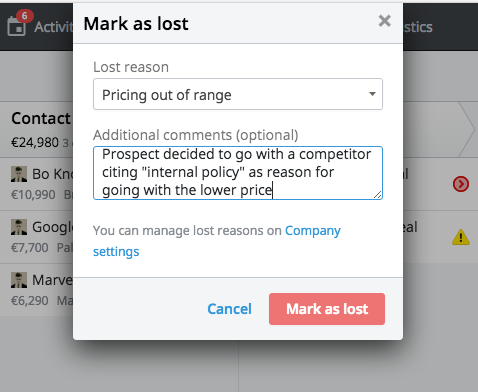 Now, simply include the lost reason column to your list view, and hit the export button below. Once you’ve taken these steps, you can offer a meaningful statistical analysis on your team’s performance – weekly, quarterly and yearly. Standardizing lost reasons means you can always go back to the data, analyze it and improve your sales activities accordingly. What needs are you most successfully addressing with your product/service? Which companies have the best product/need fit? 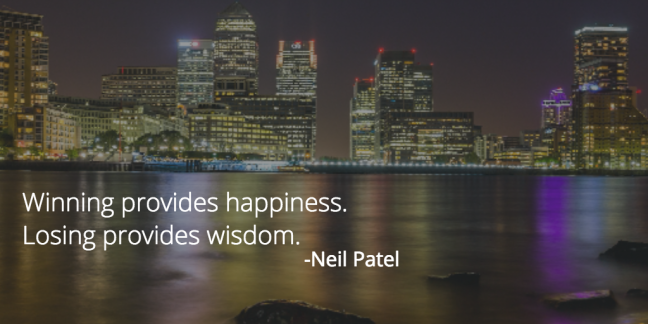 What people are you most successful at selling to? Are they managers and specialists looking after their departments? CEOs and owners addressing the pain points in their company? Someone else? Are the decisions made by a committee or a single head of department/company? Are the decisions based on return on investment or internal conviction? Are budget decisions central or business-unit based? Find out if your prospect fits your ideal customer profile; if the prospect doesn’t, consider marking the deal lost sooner rather than later. Losing early thanks to good qualification gives you the opportunity to focus on the deals that you are more likely to win. Moreover, focus on the wider picture. How can you get more “ideal customers” into your pipeline? For this, analyze the customers who fit the archetype and work your way back to how and where you found the prospect, and which activities you undertook to win them over. 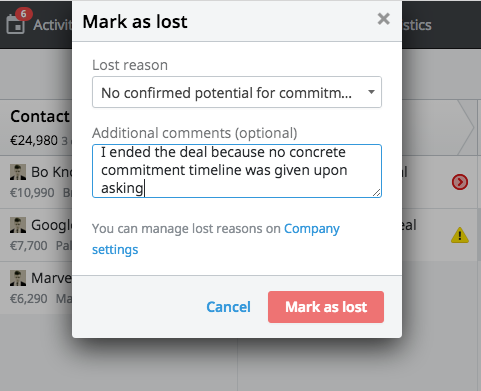 Once you get there, you can start marking deals lost even before you’ve made heavy investments in winning the deal, and marking a deal “lost” will start moving from the end of the sales cycle toward the start of the sales cycle. The biggest struggle in marking deals lost proactively is having the courage to turn away the non-ideal types – especially so if they look appealing by having large purchasing budgets. However, people will appreciate your ending the conversation and not wasting their time. What’s more, when people don’t feel pressured, they might even flip a bit and wonder about what they might be missing. The earlier you’re able to make your intentions and expectations clear, the better for both parties as you’ll manage to establish honest communication. You’ll start hearing a lot of “cheers, thank you” but also some “wait, wait, wait, I still think we have one specific need we should talk about.” That’s because you’ve created a buying atmosphere with this openness. Much of this blog post has been about being proactive, not reactive. The most important part of any sales plan is execution: Can you and your team follow the plan that you’ve set? If you have the courage and persistence to execute the proactive losing plan, while constantly analyzing your lost reasons, you’ll start improving your hit-miss ratio immensely. Work only on deals that are 70% winnable, and get everyone else to do the same. In a previous life when I was selling training courses to companies, I hired a young and bright new salesman – smart and hard-working, well-prepared for presentations, and so on. But more importantly, his pipeline looked absolutely fantastic at the beginning of each month, making it seem as if all upcoming months were about to be great for sales. After a while, however, we realized he was having challenges. He would begin a month with 10 great leads, but by the end of that month most of them wouldn’t have moved one bit along his pipeline. So what was the problem? We discovered that he was getting the“we’re still thinking about it” treatment. When our new hire changed his tactics and asked his prospects whether they were ready to place an order that month, he found that only one was willing to purchase. Moral of the story? Had he been better at losing, he would have been far better at winning.